NASA's Curiosity mega rover has successfully crossed over the 'Dingo Gap' sand dune- opening the gateway to the science rich targets in the "Moonlight Valley" and Martian mountain beyond. "I'm over the moon that I'm over the dune! I successfully crossed the "Dingo Gap" sand dune on Mars," Curiosity tweeted overnight Thursday. "Moonlight Valley" is the name of the breathtaking new locale beyond Dingo, Curiosity Principal Investigator John Grotzinger, of Caltech, told Universe Today. Curiosity drove westward over the 1 meter ( 3 foot) tall Dingo Gap dune in stellar style on Thursday, Feb. 6, on Sol 535. Dramatic before and after photos reveal that the rover passed over the Red Planet dune without difficulty. They also show some interesting veins and mineral fractures are visible in the vicinity just ahead. "Moonlight Valley has got lots of veins cutting through it," Grotzinger told me. The Martian dune lies between two low scarps sitting at the north and south ends. "The rover successfully traversed the dune in Dingo Gap," wrote science team member Ken Herkenhoff in an update. 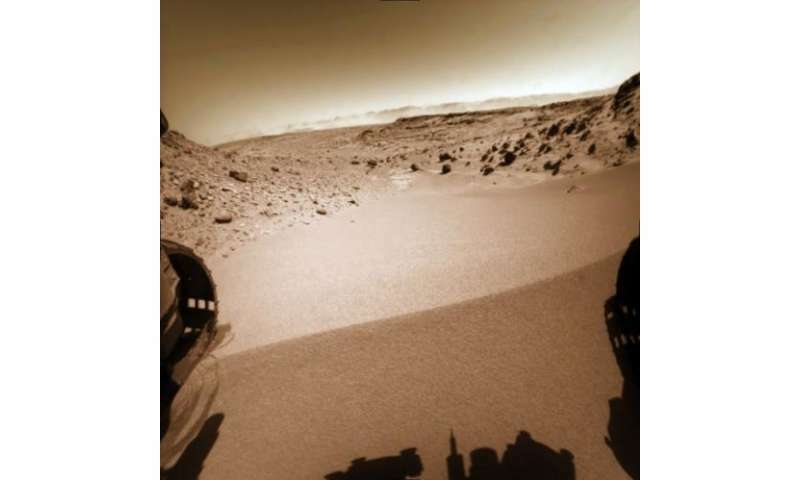 Since arriving at the picturesque "Dingo Gap" sand dune about a week ago, Curiosity's handlers had pondered whether to breach the dune as an alternate pathway into the smoother terrain of the valley beyond as a work around to avoid fields of rough rocks that have been ripping holes into the robots six aluminum wheels in recent months. "We're guessing it will be softer on the wheels," Grotzinger informed me. Before giving the go ahead to move forward, engineers took a few days to carefully assess the dune's integrity and physical characteristics with the rovers science instruments and cameras to insure there wasn't the potential to get irretrievably stuck in a deep sand trap. The team even commanded Curiosity to carry out a toe dip by gently rolling the 20 inch (50 cm) diameter wheels back and forth over the crest on Tuesday, Feb. 4 to insure it was safe to mount. They won't take any chances with safety, recalling that rover Spirit's demise occurred when she because mired in a hidden sand trap in 2010 from which there was ultimately no escape. She froze to death during the bitter Martin winter – more than 6 years into her 90 day mission. Opportunity also got wedged at the seemingly endless dune field at "Purgatory Dune", that nearly doomed her early in the now decade long trek. Engineers spent weeks on the extrication effort. Since last summer, Curiosity has been traveling on a southwestward route to the breathtaking foothills of Mount Sharp, her ultimate science destination. The westward route though Dingo will soon lead Curiosity to a spot dubbed "KMS-9" where the team hopes to conduct the first rock drilling operations since departing the Yellowknife Bay quadrant in July 2013, into areas of intriguing bedrock. "At KMS-9, we see three terrain types exposed and a relatively dust-free surface," said science team collaborator Katie Stack of the California Institute of Technology, Pasadena. The missions science focus has shifted to "search for that subset of habitable environments which also preserves organic carbon," says Curiosity Principal Investigator John Grotzinger, of the California Institute of Technology in Pasadena. But first, with the dune now safely in the rear view mirror, the team plans a busy weekend of research activities. A big science program using the X-Ray spectrometer and high resolution MAHLI camera on the robotic arm is already planned for this weekend. "The arm will be deployed to investigate some interesting veins or minerals filling fractures in front of the rover," says Herkenhoff. "ChemCam will search for frost early on the morning of Sol 538 (Saturday), then analyze targets Collett and Mussell along the vein/fracture fill later in the day." Thereafter Curiosity will continue on its journey across the floor of Gale Crater, taking images and atmospheric measurements along the way to the sedimentary layers at the base of Mount Sharp. I still think it was awefully brave to go over that dune. I wonder how the rover will get around if it loses the rubber from the wheels? It must not be good, or they wouldn't be taking such drastic measures to preserve the rubber. 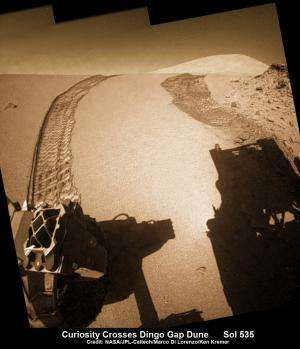 At this point, I will be very happy, but very surprised if Curiosity actually reaches Mt Sharp. What are the chances that there will be a clear path that the rover can manage all the way there, and that the rover doesn't have some mechanical failure along the way? Notice that they are frequently saying how they have completed their primary mission goal already? That sounds a bit like PR, just in case they don't make it to the mountain, to cover their tails. "I wonder how the rover will get around if it loses the rubber from the wheels?" That said, I think it's encouraging that puncture mitigation strategies are being pursued (one of the reasons they breached the dune was to traverse less rugged terrain). "Grats" tweeted chinese moon rover Yutu. Oh, wow, I didn't realize that. Thanks for the heads-up!! It looks like rubber over aluminum from all the pictures, so I never bothered to look up that detail (why would I?). That's actually a relief I guess, just as long as they hold together. If one of them becomes totally disabled, that would place even more strain on the others. Since those rocks can so easily puncture the rover's tires, imagine a person in a space suit working there. That's a really hazardous place. You would need to watch every move you make. 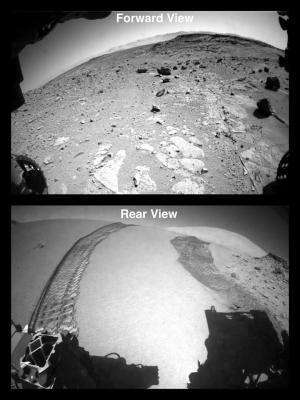 If you go to the msl jpl website and click in the 'raw images' link you can see the latest photos from all the cameras. They are already quite a ways from the dune. It's interesting to see the rear pics of the tracks back to the dune in the distance. You can also see that some of the wheels have big holes punched in them. One has a large tongue of material pushed inward. This is a serious problem. This dune crossing wasn't reported for a few days even though the pics were posted here right afterward. Wonder why?